Our professional moving team can help you move and transport single items like office furniture and equipment. Rentalorry can assist in the moving of all your office equipment and documents quickly and efficiently to your new place. Relocating your place of work can a troublesome affair. From packing countless office supplies to moving all that furniture, shifting your office can be such a hassle. But all that tedious work can be avoided when you have a team of professional movers and packers to assist you in your moving. Rentalorry has years of experience in the commercial office moving industry and we are the preferred choice for many companies in Singapore. 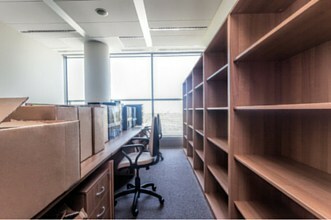 Unlike typical home moves, office relocation involves a lot more items and a lot more people. Proper planning needs to be done to ensure that the move can be carried out efficiently and effectively. In addition, the company needs to carry out the relocation as swiftly as possible because the longer it takes to get the company up and running again, the more money it may stand to lose. These problems can be easily avoided when you use a professional moving team and that is why we encourage customers to look into this option before carrying out the move itself. Commercial office relocation sometimes require the use of extra labor and specialized equipment. Hence, it is better for us to see the actual scope of the moving assignment so that we can provide an accurate and competitive quote for our customers. We boast a fleet of many different vehicles to suit various moving needs. From large cargo trucks to shift bulky cupboards ad drawers to smaller vans to transport chairs and tables, we have a variety of vehicles of different capacity and specifications to make the moving process that much smoother. Our vehicles also come with top notch suspension systems and power steering to ensure that the ride is comfortable and safe for your goods. Movable loading decks can be found on the back of most trucks so as to make loading those cumbersome items easier and less tiring. Our team of packers are well trained, and will ensure that all your office supplies are pack neatly. Our packers will sort out, pack and label office supplies by category to ensure that everything is organised and hence make unpacking a breeze later on. Delicate articles like glass tables or glass cabinets will be wrapped in bubble wrap to prevent scratches or breakages. our professional packers are also friendly and very experienced and will definitely ensure that everything is done in the most efficient way possible.